It's been a while since I've been to a gig with support acts worth turning up early for but last night was an exception and if you didn't show up until 9pm then you not only missed two very good bands you also missed out on a free CD recorded that day by all three bands. Laurel Collective nailed their show. Packed with energy, effortlessly delivering tight complex rhythm changes, loud gritty chords and loads of great vibes into the room. Listening to their MySpace today I feel maybe their recorded songs don't convey the energy they have live but they still sound good and I would highly recommend catching one of their shows. Really, they were far better than a few of the headlining acts I've seen over the last year (I won't name any names). I hope Geoff Travis (founder of Rough Trade Records) feels the same, I'm pretty sure he was standing right behind me! 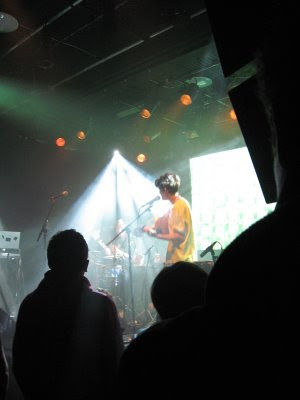 Micachu & The Shapes didn't keep us waiting, something that always scores extra bonus points with me. All their instruments (and they have many including a hoover) were positioned very close to the front of the stage creating a nice intimate feeling. Great sound, tight performance and a really good vibe from some incredibly talented and ridiculously young looking musicians. Possibly too experimental a sound to please everyone but they convinced me and I'd love to see them again. On a sad note, about two songs in a guy who was standing near me was taken ill and was ushered out by a boy whom I'm informed was his son. It looked pretty serious and an ambulance was called. Not really in the mood for music much after that, I left. If you are that boy and happen to read this, I hope everything is OK and you got the support you needed, I'm sending you the best of wishes. just so you know, the guy had a funny reaction to a few pints mixed with anti-histamines for his hay fever. he passed out but came round later on and is fine now. Over and out. Hey, thanks for letting me know. Happy to hear it wasn't anything more serious, he looked so unwell.